The text on this RSVP postcard is fully customizable. The theme is aged parchment and autumn colors of beige, brown, and rich burgundy. Great for an autumn wedding. Printed on ultra-heavyweight (120 lb.) card stock with a high gloss finish. Does NOT come with envelopes. 4.25" x 5.6" affordable card. 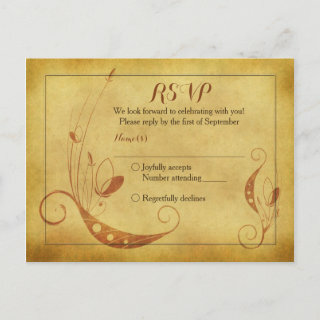 Zazzle wedding reply postcard cards are printed and shipped in the US, even if ordered off of international sites. Please allow sufficient time for international shipping.